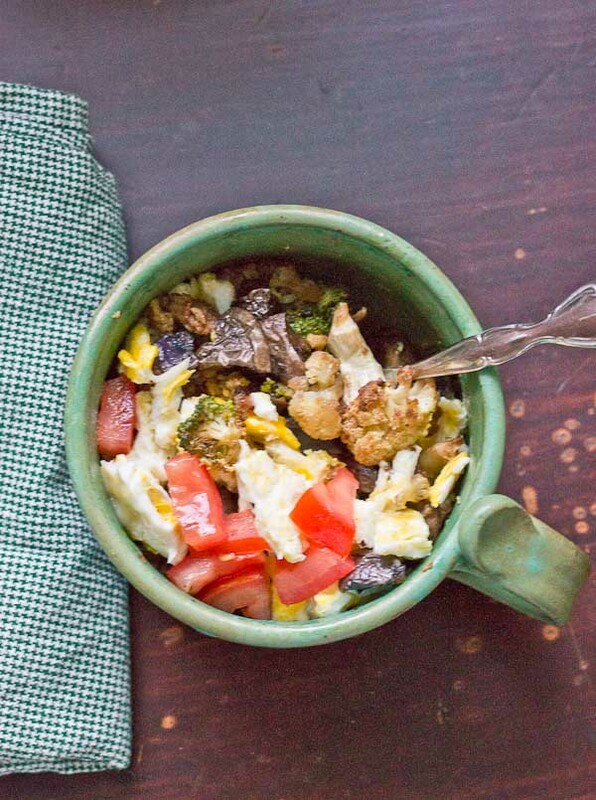 Yummy breakfast bowl packed with roasted veggies makes for an easy weekday morning! Healthy and veggie-filled breakfast ready in less than 5 minutes! Hey friends! Guess what day it is…. every time I think about hump day I can’t stop won’t stop with receipting the Geico camel commercial…. that camel cracks me up every time. So I’ve been craving more veggie-filled breakfasts. 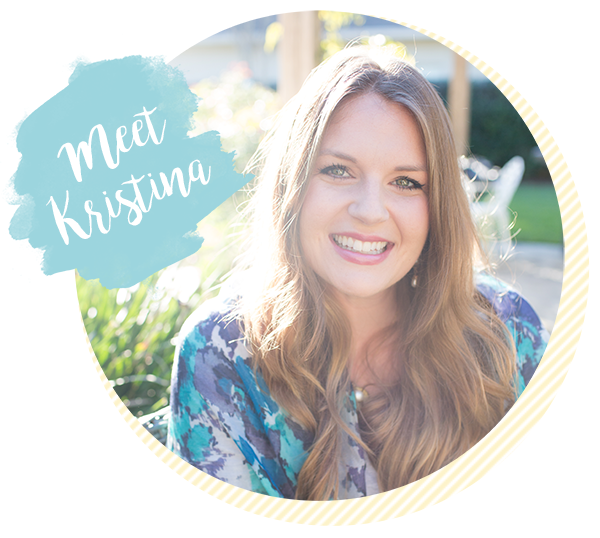 I do veggie smoothies which are quick, however I’m an egg girl! A lot of times breakfast looks like eggs with cheddar and toast. I know NO color!! But making a veggie omelet just isn’t fast enough when I’m rushing around in the morning. 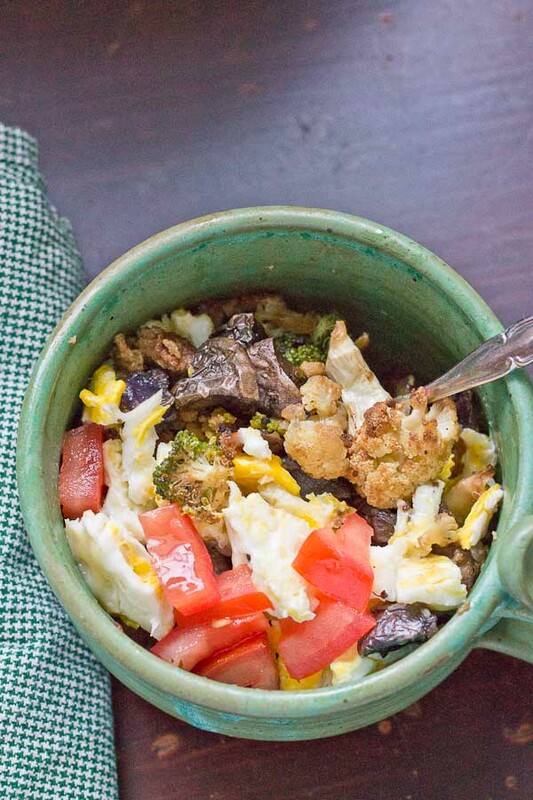 Enter the Veggie Breakfast Bowl. This breakfast bowl is rocking my socks this week. So I roasted all the veg this weekend… and just pop it in the microwave while I’m cooking my egg in the morning. Genius right? It’s not everyday that you get roasted potatoes and broccoli in the morning. We’ll that’s a think of the past. I can’t wait to see what type of breakfast bowls I can think up! Butternut squash, cauliflower, and mushrooms are on tap for next week. YUMMM. How do you get veggies at breakfast? What would be your ultimate veggie bowl combo? Roast veggies in a 425 degree oven, on a big sheet pan lined with parchment paper. Dice vegetables up in bite sized pieces and roast them for 25-45 minutes depending on the veggie. Scramble egg and top with cheddar cheese. Heat veggie sausage in the microwave according to package directions. Add all ingredients to a bowl and top with favorite mix ins! Found your website by way of My Fitness Pal and I’m enjoying the visit. Wondering if you have a favorite veggie sausage patty for this recipe? I’ve never tried them before. 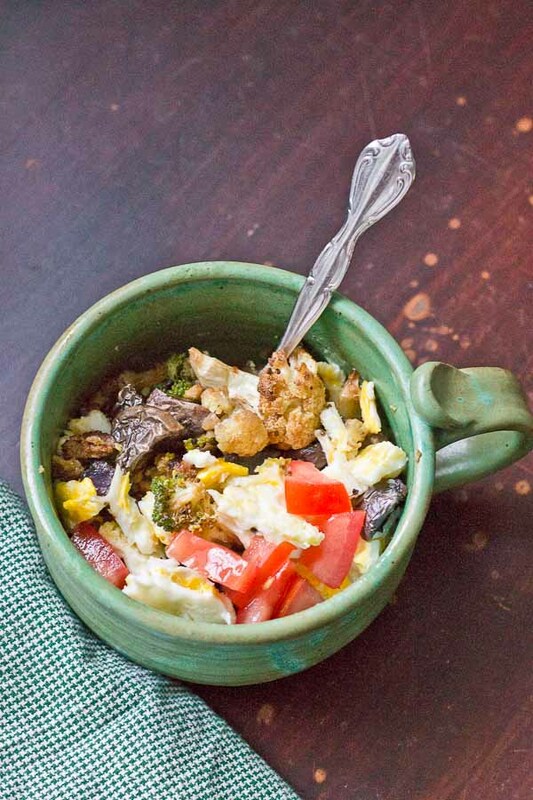 Love the notion of more veggies with eggs for breakfast and will surely try this one! Thanks for stoping by!! I do have a fav breakfast patty– Publix Veggie Sausage Patties are my favorite and a close second is Morningstar Original Breakfast Patties 🙂 Enjoy!! yum! looks like a nice change from my sweet breakfasts! Ah, I love adding veggies to breakfast to start my day off right. In the summer, I’ll add greens to my smoothies. In the Fall, I freeze pumpkin in ice cube trays to add to smoothies. Living in FL, I can enjoy smoothies through most of winter. Although, I love bell peppers, roasted kale, broccoli, and avocado in my egg bowls and omelets day-to-day. When I have left over sweet potatoes or red potatoes I add ’em in there too. Love the idea of adding mushrooms and other seasonal root veggies too. I could eat roasted vegggies like candy- and with potatoes and sausage too- Genius. Pinning! What a great way to get in some veggies first thing in the morning! 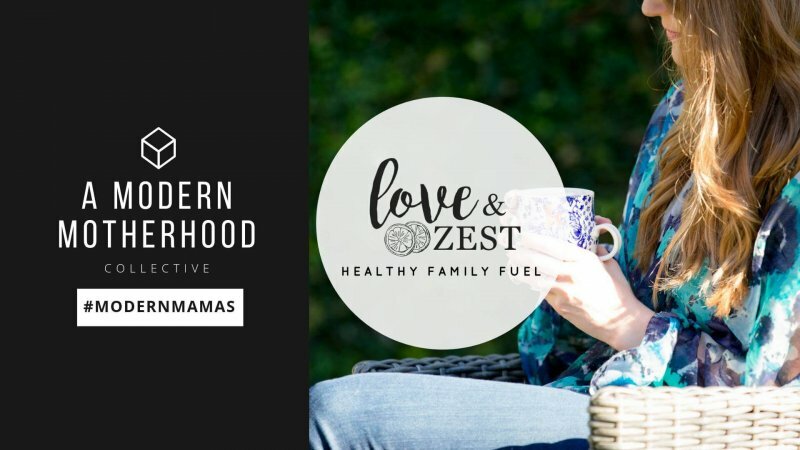 I’m not much of a smoothie gal, so find it hard to get down with the green smoothie movement. This could be a great alternative to get veggies in every meal! I like to finely chop bell pepper and red onion and combine in a container in the fridge; really easy to toss in with eggs (and a handfull or so of baby spinach) during the week! That Geico commercial! Haha Steve loves that one! I am ALL about veggies for breakfast, especially now that I’m coming down with a cold! I always have roasted vegetables on hand so this is perfect! Eureka! Now I know what to do with some leftover veg from the night before… great thinking!